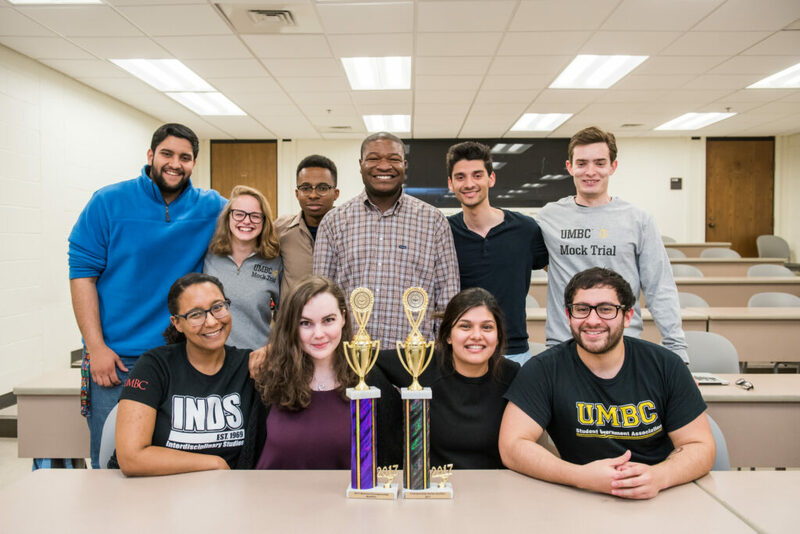 Just six years after its founding, the UMBC Mock Trial team is already taking the nation by storm. 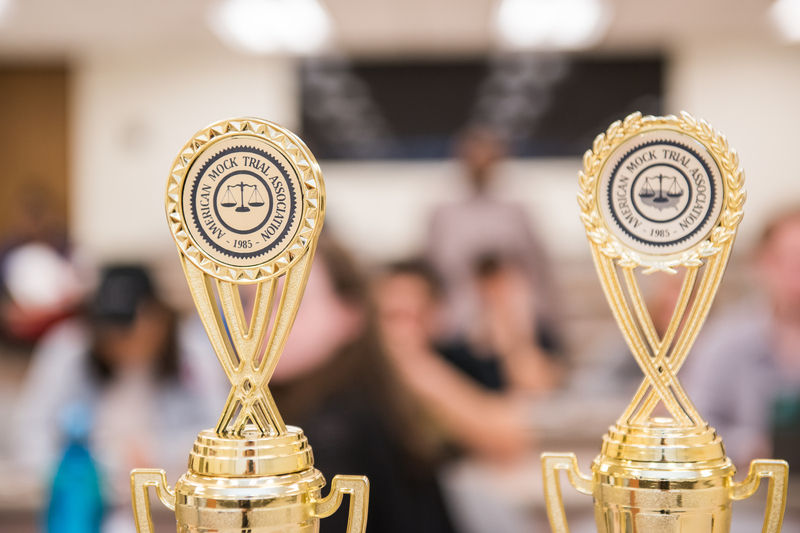 Having outperformed hundreds of other college and university teams since September, these exceptional undergraduates are preparing for a historic trip to the American Mock Trial Association’s National Championship Tournament in Los Angeles later this month. The tournament includes a select group of only 48 teams from across the United States. This year has been a heady one for the team, spending weekends on the road to compete in—and win—invitational tournaments up and down the east coast. After finishing the Baltimore Regional Championship with a record of 5–3, both the A and B Teams advanced to the Opening Round Championship Series, held March 25–26, where the A Team secured one of only six bids to the national competition and the B Team narrowly missed capturing a second. Graduating seniors Dylan Rogers Elliott, history; Zuhair Riaz, political science; Brandon James, English; and Kayla Smith, interdisciplinary studies, have earned a collective 14 individual mock trial awards, reflecting hundreds of hours spent writing and memorizing materials, in addition to the intense collaboration and team planning required to overcome more established teams. 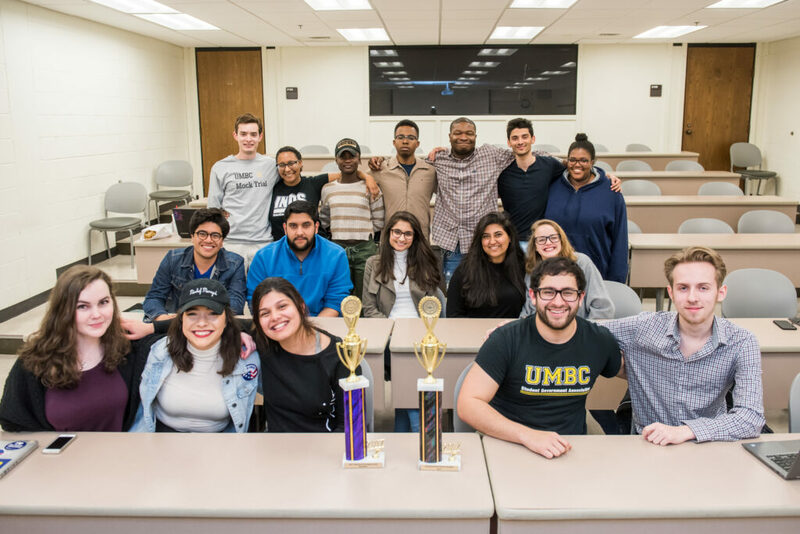 UMBC Mock Trial meets to practice after earning a spot in the national tournament. 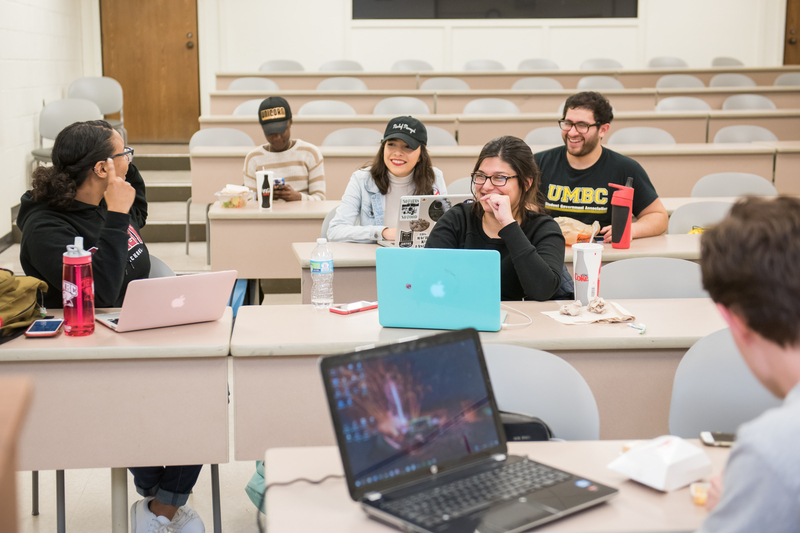 While mock trial teams tend to attract students majoring in the humanities and social sciences, UMBC Mock Trial includes students from all three colleges, including a biochemistry major. Team members get experience honing their speaking, writing, and presentation skills, applicable to any career path. For some, like Kayla Smith, the team has also inspired future graduate school and career plans. She’ll be following in the footsteps of UMBC Mock Trial alumni who have attended prestigious law programs at Georgetown University, UCLA, William & Mary, the University of Maryland, and the University of Baltimore. As news of UMBC Mock Trial’s win at regionals spread during the height of the basketball postseason, the campus found itself cheering yet another UMBC team’s remarkable victory. Retriever fans can help UMBC Mock Trial prepare for the 2017-18 season with a donation to support team travel and other expenses. Header image: Kayla Smith, Dylan Rogers Elliott, and Zuhair Riaz. All photos by Marlayna Demond ’11 for UMBC.